Making a small marine steam engine the beginners way. Although I've been a member here a while now I have yet to post any build work but have decided now to give it a go. I'm a beginner to this hobby and so far have only made very simple wobbler engines and now just about finished making Stewart Harts' Potty mill engine. I don't have a mill yet but expecting to buy one in the next few weeks so needed a simple project to tide me over for a while till I get a mill - I decided to have a go at making a small twin cylinder double acting marine style engine. The engine will be to my own design - I've got an idea in my head how it will look but other than that I'm just going to make it up as I go along - Stewarts' cylinder and valve design for the Potty mill worked well so I intend to broadly stick to something similar with different dimensions. As this is all fairly new to me I'd really appreciate any advice / tips as well as criticisms or prompts if you think I've overlooked something etc. At the moment I've damaged the standard lens on my camera and having to use a zoom for now so please forgive me if the images aren't great. I decided on cylinders made from aluminium and wanted flanged ends to mount the from below and to secure the cylinder heads. 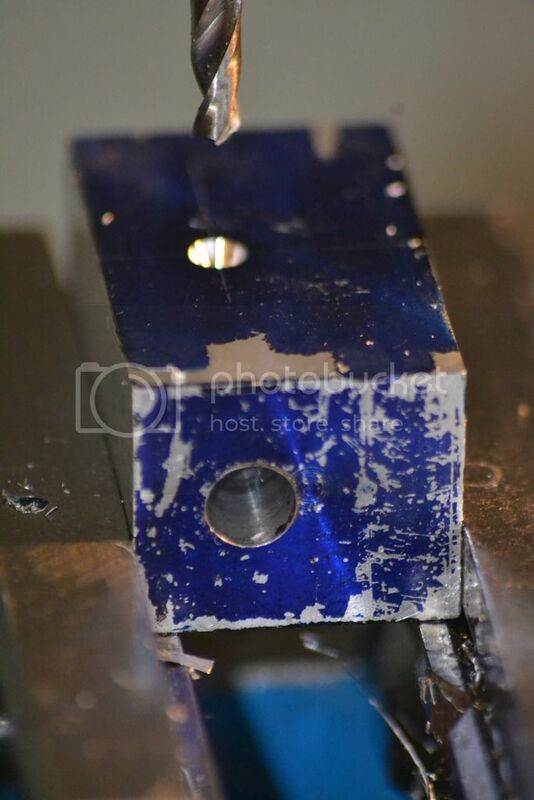 I didn't photograph turning the main body as it's fairly self explanatory, the first step of any challenge was to machine a flat face to accept the valve chest. At little filing later we have both cylinders and valve chests cut to size ready for drilling. Re: Making a small marine steam engine the beginners way. Nice start! Clever way to do the flats without a mill. 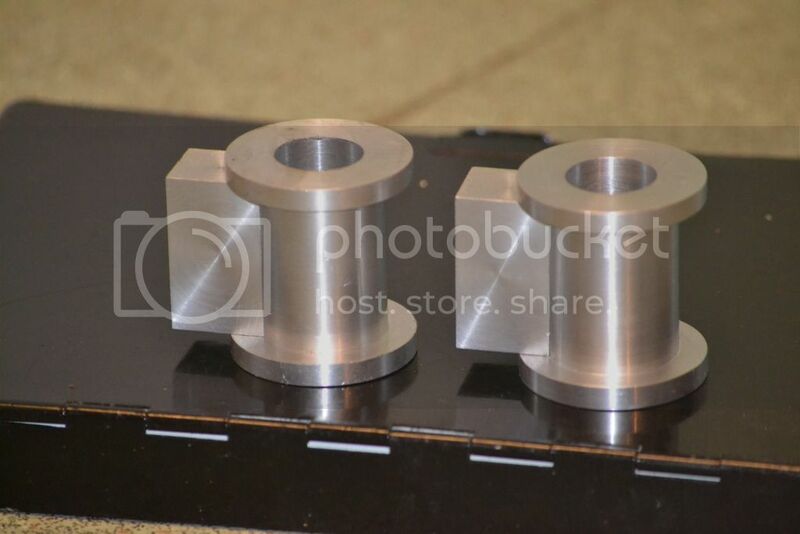 How are you going to bolt the valve chest to the cylinder bodies? Hard to tell from those angles, enough depth left on the bodies to drill and tap before the bore? How big are the cylinders? Pretty neat. Like Chris said...clever. It's a bit deceptive from the camera angle but I should have sufficient depth to drill and tap holes in the cylinder wall - at the very thinnest part the wall is about 3.5mm opposite the machined flat but with the bolts off the centre line of the chest I will be drilling into a deeper part of the cylinder wall (I hope !). The cylinder bore is 24mm and the stroke will be 32mm (or possibly a couple of mm less depending how deep I make the piston). I'll possibly get the pistons made and the cylinder ports drilled tomorrow. Nice start Peter, the cylinders look good. Think I've seen that, some sort of vertical slide for the cross slide table? Do you have a picture of it? Peter, cylinders are bigger than they looked in the pics, should be fine for bolts. Nice start! Yes, exactly that Chris. 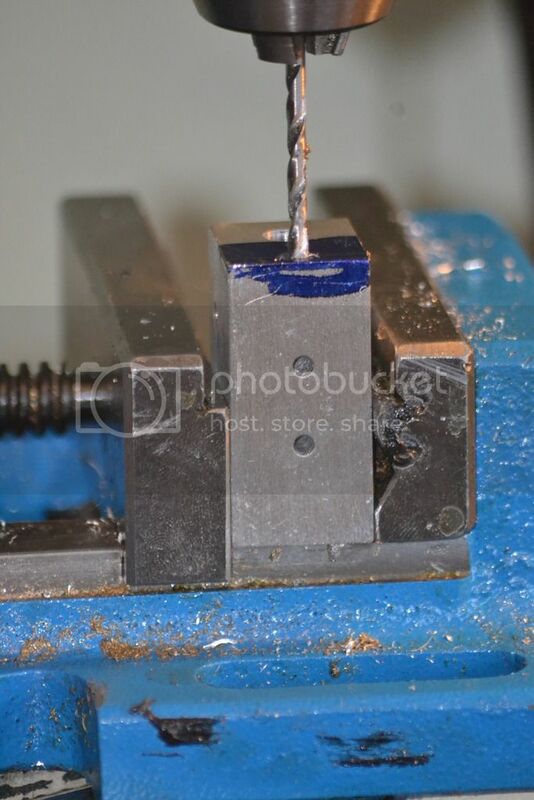 Here's a link to the Taig accessory page for the Milling attachment for their lathe (that's the little lathe I have. Used to be all I had till I got my Grizzly). Don't know what kind of Lathe you have, but if you can figure out a way to mount it on your cross slide it could work for small things. As for the milling attachment I did consider one, I put it off for a while to see how serious I was about this hobby - I've only had my lathe for 7 months and wasn't sure how I'd manage in this new hobby. Fortunately now I've bought most of the essential tools I need and despite a few minor setbacks with my models I'm confident I'll stick at it so have decided to go the whole way and buy a mill. Here in the UK the model I want from the same supplier as my lathe is about £600, it seems to be a popular machine and will be large enough for the work I'm likely to do so I intend to buy one in the next few weeks. I think there is a possibility I'll finish this engine before I get the mill but if not I will finish it just using my lathe. 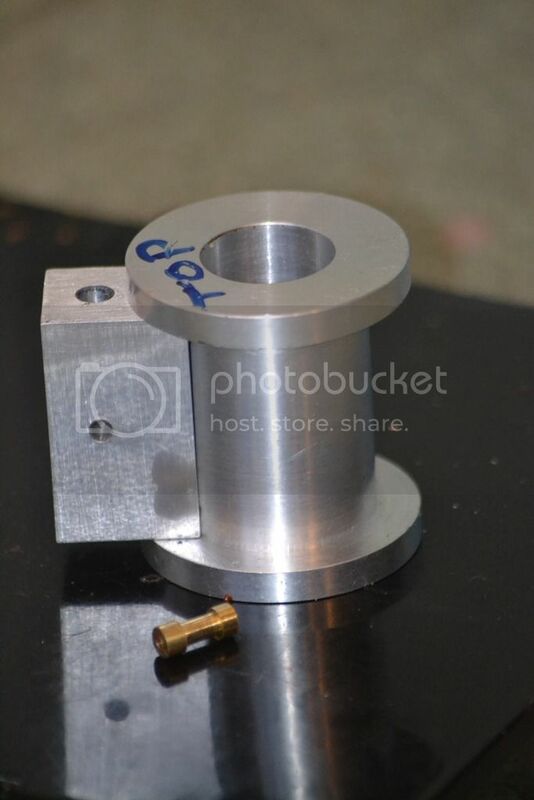 I suspect there are quite a few beginners out there like myself who don't yet have access to a mill and are looking for something relatively simple to build that can be made using just a lathe so I'd like to have a go at creating one. I was first attracted to Stewart Harts' Potty mill engine as it is designed to be built without a mill and hopefully this will be the same. Incidentally I've just about completed the Potty engine and got it running nicely and I'd thoroughly recommend it to another beginner. All I need to do is paint it once the materials I've ordered arrive then I'll post a video of it running. With a bit of luck I'll get the pistons done today - I ordered some silicon 'O' rings as piston rings as an afterthought whilst buying something else so it meant I'd already bored out the cylinders when they arrived but they seem to be a good match (possibly very slightly too tight). I'll experiment a bit with the fit today in the hope I can use them. 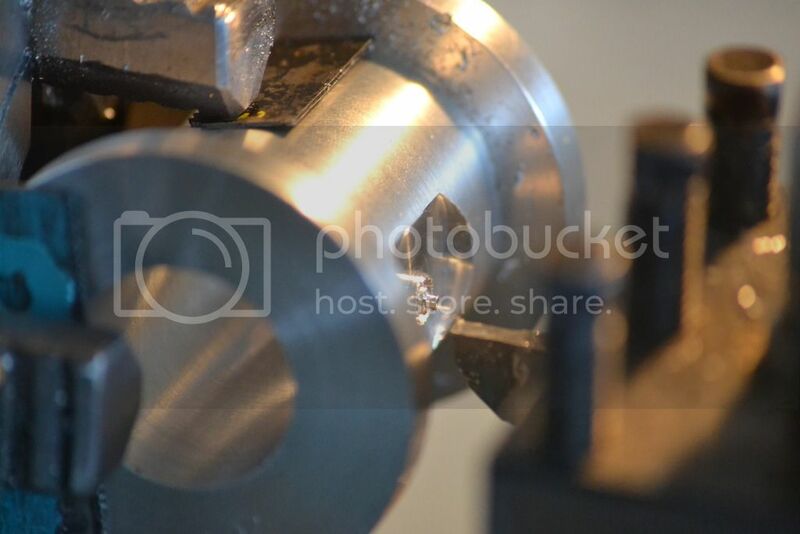 I've considered using 2 rings per piston and cutting the piston slightly undersize so only the rings touch the walls - does this sound a good idea ? I've never used the 'O' ring method before, having previously just used rolled up PTFE tape so wasn't really sure about the fit I should be aiming for. Hi Peter, What a great way to enter engine building and design in one stroke. You may be a 'beginner' however moving to designing and machining utilising stock materials is a pretty sophisticated path. You certainly show confidence and ability as designing and making experimental or prototype engines is often where accomplished model engine makers finish their days. A while back a selection of small aluminium 'steam' designs was highlighted in the Australian Model Engineering magazine, the work of a man into his eighties, thus a creative expression of a person of great experience and knowledge. About the only thing I can think of that may help you at the moment, supposing you intend to run your engines on steam, is to keep in mind the effects and consequences of temperature with respect to your materials. Steam and air are a bit different. Regards, Paul Gough. Good to see you putting this up on here Peter and you've made a great start - I'll be following as well.. If your o rings are sized correctly they should be a bit larger than the bore say 24.4mm OD as they need to be squashed slightly to seal. You may get away with using one ring, the last three engines that I have done I have cut grooves for two but only needed to use one ring. If only running on air then 0.001" smaller piston will be fine. 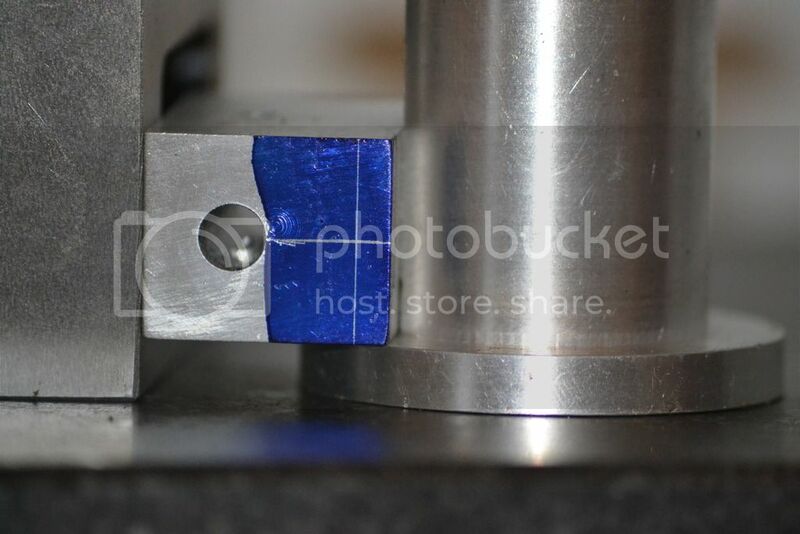 Infact as the cylinder is aluminium the same clearance will do for steam, its only when you have an ali piston in iron or bronze that you need more clearance for the piston to expand. Thanks Jason, it sounds like the rings I have will be fine then, they require just a very slight persuasion to fit the bore, I intend to make the pistons from brass. I didn't do the piston as originally intended but managed to get one of the valve chests drilled out - the paints for my Potty mill engine have now arrived so I'll make a start on that later. Anyway although there isn't really a lot to show with the valve chest I did take a few photos in the hope that less experienced members like myself can understand how this engine will (hopefully) work. 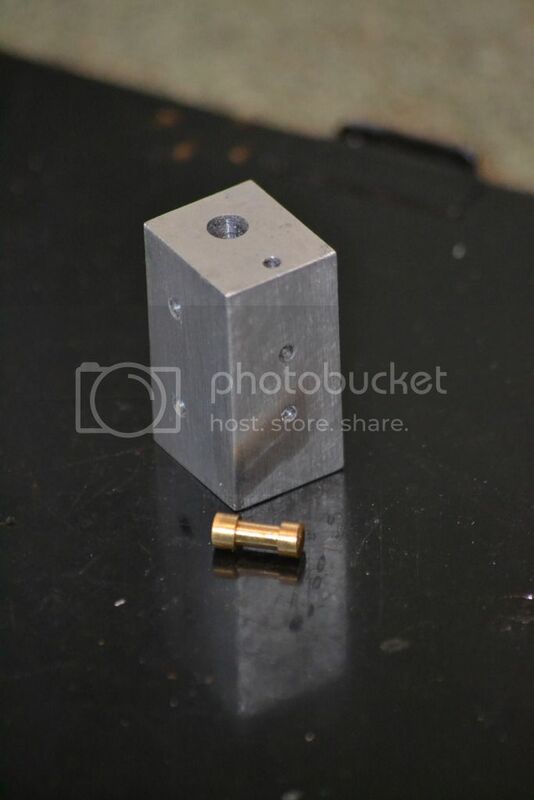 Essentially it's a small spool valve design with a 'dog bone' shaped piston oscillating within a cylindrical bore to open and close the ports as necessary. 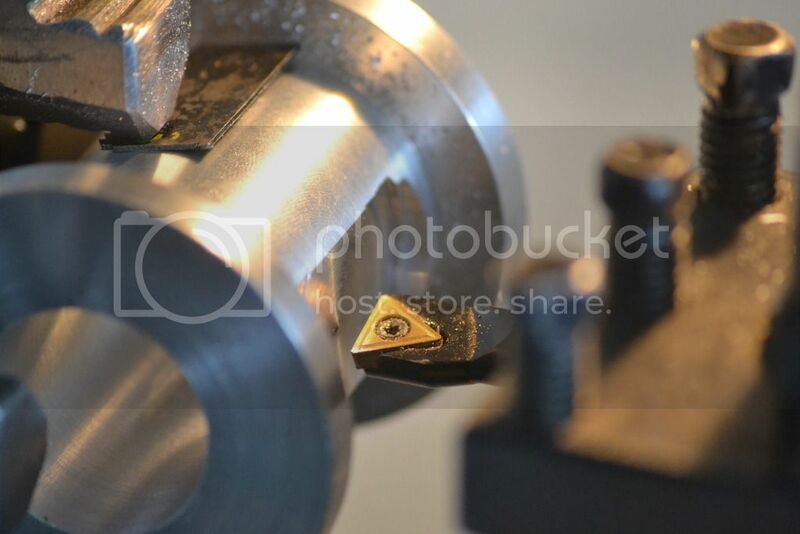 In my previous engine the 'transfer' passages (or whatever they are called) were drilled within the cylinder wall but this time I've decided to drill then within the valve chest itself. I'm not sure this will offer any improvement but it will allow me to drill a larger passage and I wanted to see how well it works. I then drilled another couple of holes as the exhaust ports before proceeding with the 'transfer passages'. These will follow parallel with the valve bore and take the steam / air to the cylinder ends. 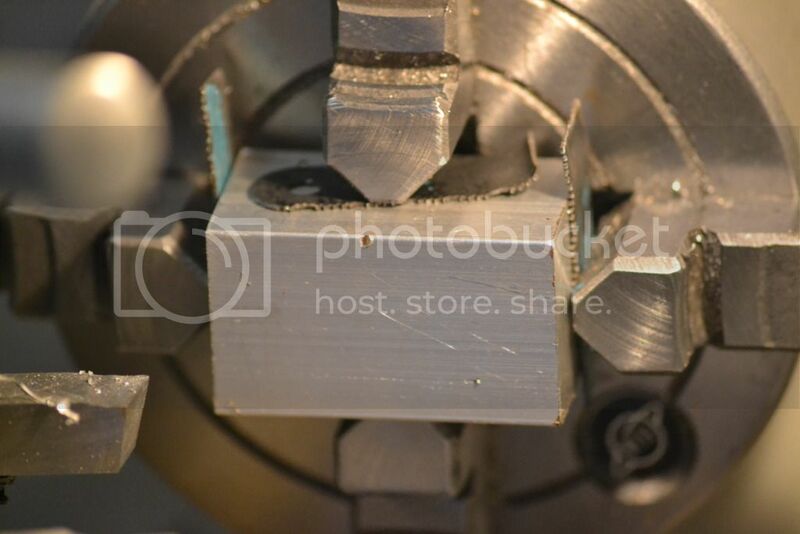 I want them to exit the valve chest within the cylinder flange where I'll cut 2 small cross passages into the cylinder. 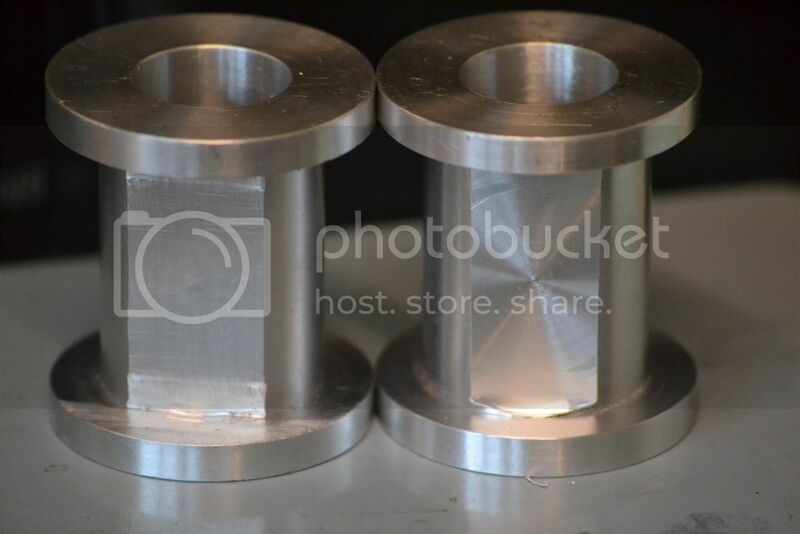 It is my intention to make a close fitting hollow sleeve to form an airtight connection between the ends of the valve chest and the cylinder flanges. These passages will stop just short of halfway along the steam chest and meet with 2 crossholes leading from the valve bore. 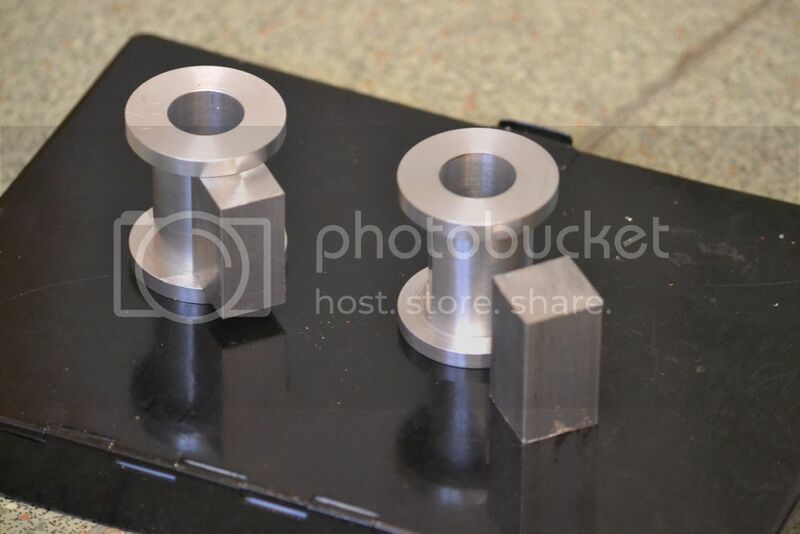 In the photo below the cross holes leading from the valve can be seen - these will be plugged to form an airtight seal later. The 2 holes on the left are the exhaust ports, the 2 on the right are the ones that will be plugged, on the wide face hidden from view is the single inlet hole - the transfer passage bores are currently 3mm but having relooked at it I think they may need opening out a bit. Showing the other side of the chest with the inlet and the transfer passage within the flange. Bad Behavior has blocked 14778 access attempts in the last 7 days.